Gerald Howard (Howdy) Young was born November 16, 1935 in Oklahoma City the eldest son of Gerald Martin and Ione (Poole) Young. He completed this life on Tuesday, September 11, 2018, at the age of 82. Howdy was raised in Oklahoma City where he attended Gatewood, Taft Jr. High and was in the 1953 graduating Class of Classen High School. He graduated with a degree in Mechanical Engineering from O.U. in 1958. While at O.U. he was a member of Sigma Nu fraternity. Following his graduation he served in the U.S. Army both active duty and in the reserves. Howdy was the owner and President of Young Exploration Company which was founded by his father. He was a member of the Oklahoma City Golf and Country Club, The O.U. Touchdown Club, The Sooner Club, The Petroleum Club and the Honkers Hunting Club. In his free time he enjoyed scuba diving, skiing, racing, camping and O.U. football. He had more hobbies than time or money. 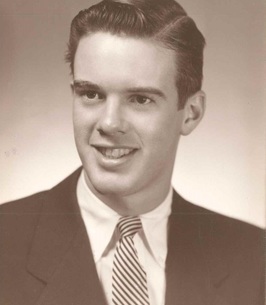 He is survived by his sons, Gerald M. (Jerry) Young, II of Lafayette, LA, Howard K. Young of OKC; his daughters, Jenna E. Young of Ft. Worth, TX and Andrea A. Weiss of OKC; his grandchildren, Abigail, Rachel and William Young, and Maggie Weiss; his brother, Martin G. (Hi) Young of Boulder, CO; his nephew, Corby Young of Boulder, CO.
Services will be 11:00 a.m., Saturday, Sept. 15th, in the Rose Hill Abbey Mausoleum Chapel, 6001 NW Grand Blvd., with inurnment to follow. To send flowers to the family of Gerald Howard "Howdy" Young, please visit our Heartfelt Sympathies Store.